Well, I think there must be hundreds of thousands of recipes for pumpkin pie circulating out there. I had intended to post my favourite recipe for this wildly popular fall dessert last month, but never got there. However, I was wowed by the incredible variety of mouth-watering recipes for pumpkin pie that kept popping into my WP reader. They all looked so gorgeous that I almost didn’t post this recipe; but then I took a big step back, and got clear on the original intention of my blog- to post my favourite, tried and true recipes: the ones that have become a tradition in my family. This particular recipe has been in my recipe box for as long as I can remember. Yup, written on an actual 4” X 6” recipe card! Whoa, it’s been there for a very long time, given to me by some foodie friend or colleague long ago. Of course back then, the word “foodie” didn’t exist: I think we called each other “gourmets”. LOL (oh, wait a minute, that didn’t exist back then either…) Sorry, I’m getting off track… I love this recipe because the walnut orange trim gives the pie a surprising dimension – just that extra layer of flavour that you don’t expect. The pie itself is a perfect sweetness, not cloying or so rich you can’t have a second piece! Thank goodness for that!! Serve it with whipped cream. I haven’t found anything better!! About the pie crust: use your favourite recipe for this. I have experimented with many, but this time I tried the recipe of a fellow blogger at wishfulwhisking.com Here is the link. http://wishfulwhisking.com/2013/10/13/the-perfect-pie-crust-and-apple-blackberry-pie/ . It turned out beautifully! I made the whole pastry recipe and used half of the dough for this pie. I froze the other half for some thing I’m sure to make over the holidays. Mix ¾ cup brown sugar, flour, salt and pumpkin spice together in a medium bowl. In a separate bowl, lightly beat the egg. Add the pumpkin and evaporated milk and mix well. Add the pumpkin mixture to the sugar mixture and stir well. Pour into the pie shell and bake for 15 minutes at 425°. Reduce heat to 325° and bake for 15 minutes more. Mix butter, brown sugar, orange rind, and nuts together for the trim. Spoon the trim around the edge of the filling. Return pie to the oven and bake at 325° for 15 minutes until the filling has set. Then when nobody is looking, have a second piece!! It’s snowing on your page! Also…this recipe looks beautiful, I have never considered combining orange zest and pumpkin before, it seems like it would be a really unique flavor. I am continuously trying to master my grandmas pie crust recipe, and while I am able to do it fairly well, it will never be as good as hers is. This recipe is a great excuse for another attempt, thank you! Ha ha! Yes, and there is snow on the ground here too!! 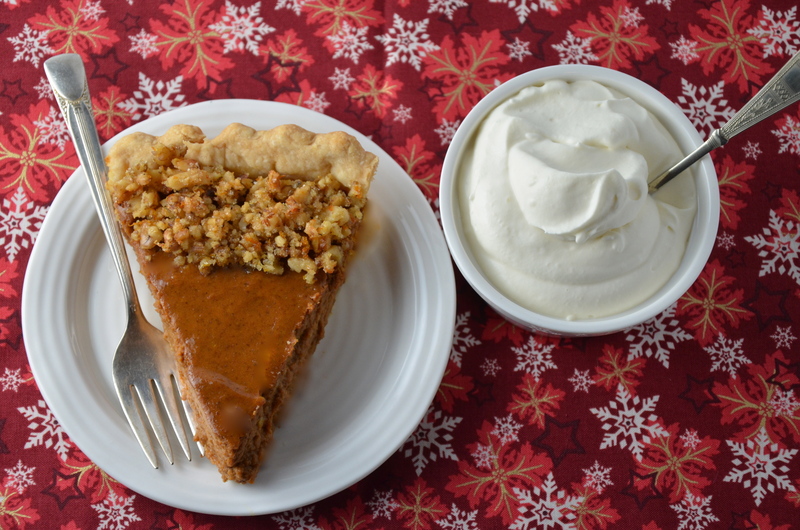 Glad you like the look of the recipe…it’s the only pumpkin pie I ever make. I know what you mean about grandmas. Mine made the best pastry on the planet and I have never been able to reproduce it. Somebody told me it’s because they used to use lard. I only use butter – maybe one day I’ll get brave and try the lard. I hope you have good luck with this pie when you try it. Cheers! Me too! And this one is my all time favourite!